The fire declared last week in Indukern caused flames between 40 and 50 meters height. It began during a transfer of chemicals. 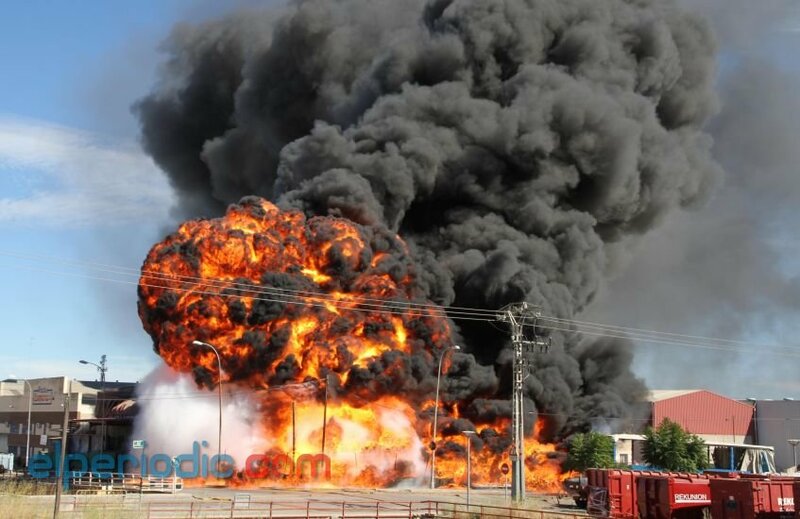 The smoke column that caused the explosion was visible throughout Valencia and its metropolitan area. The company Indukern has assured that “the technicians have confirmed that the smoke caused by the combustion of the liquid in the tanks has not exceeded the indices of toxicity”. Although the fire was controlled and extinguished, today, there are still a some firefighters who are still working on the fire extinguishing. One of the most critical moments was when a burning canister exploded on the chemical company and falls near another vehicle of firefighters. In the video you can see how some of the troops who were there during the fire that caused the evacuation of 3,000 people from 150 companies are trying to run to a safe place alerted by their colleagues and seeing that they are in the path of the drum. They ended swallowed up by the explosion caused when it hits the ground. Luckily we don’t have to regret any injure thanks to the fireproof dresses that firefighters were wearing. Which is the solution for this type of fire? Mercortecresa can offer a wide range of fire protection constructive solutions but if there is not a good investment in security, we cannot do anything. According to the College of Engineers of Valencia, time ago they warned about the safety situation of the industry because with the crisis because they can not replace the positions of engineers who leave because of retirement or any other cause.